How fit is well fancied Frosted for the Dubai Cup? I saw this grey gallop the other day and blowed if I know how he has such a good record. The grey is small, short in the barrel and a very ordinary looking horses, he must have a big heart. On just under 98% fit, to me he has the job ahead of him. Frosted (USA) - Galloped 2400m at Marmoom. “He was a very good three-year-old who kept running into American Pharaoh, which was tough," trainer Kiaran McLaughlin said. "I'm very happy he stayed in training. The year has started out great. We thought he needed the race (win in the Al Maktoum Challenge Round 1), but instead he broke the track record. He was more fit than we thought. He's trained outstanding since." 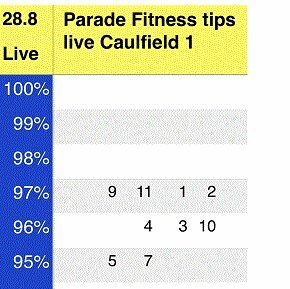 These 12 races can be the better for us on Saturday and of course the main interest to punters. get an idea who you want to be fittest. Good luck and join today, only $20 for 12 SMS fitness tips. and some of the Exotics were give ME’s and paid over $1,000! where a fitness edge has better chance to give out the win/winners. I cannot tip 18 winners, so let’s pick the best races for members. I also have to work out the broadcasting times so as to see the horses in the mounting yards. See our forum last this afternoon for the races you can study the form on. Join today, only $20 through pay pal for all this good fitness oil. Race 8 Valley we got the lot top line running 1-2-3. Big night for members and live SMS on saturday for melbourne and Sydney races, see pay pal and get the money with us. Huge night for SMS members winners galore and some great exotics in.